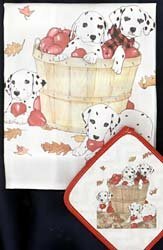 Catering to Dalmatian enthusiasts who spend time in the kitchen, this decorative dog breed set includes a dish towel and potholder. The Dalmatian towel is made from absorbent cotton and measures approximately 17" x 28". Dalmatian potholder is the quilted type with color coordinated trim and measures approximately 7" x 7". Each kitchen set is packaged in a protective cellophane bag and makes a nice Dalmatian gift item. If you have any questions about this product by Animal Den, contact us by completing and submitting the form below. If you are looking for a specif part number, please include it with your message.